There’s an industry of people working to shape public opinion on climate change nowadays, making it hard for most of us to sort out facts and reality from self-serving claims of special interests. As individuals, though, our biggest challenge may be sorting out our own bias and misconceptions – we all have some. Here are some common points of confusion, and thoughts about what you can do about them. 1. Leading American thinkers know that climate change isn’t a significant problem.Lots of very smart people, including Bill Gates, Warren Buffett and Mark Zuckerberg, are not concerned. They donate a lot of money to charity and do a lot of good work. If they thought global warming really was a big problem, they would be doing something about it, right? 2. We really don’t need to make climate change a priority now. 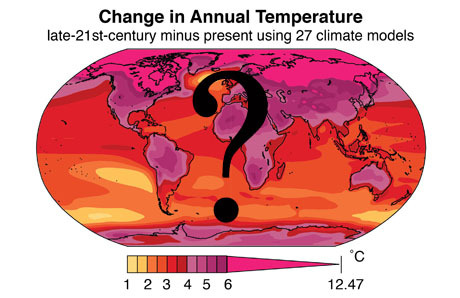 Recent evidence indicates that the planet has actually been cooling for the past 15 years. Before we disrupt the economy and our way of life, we better be really sure it’s a problem. Besides, future generations will have new technologies and a stronger economy, and be better positioned to deal with climate change. 3. It will cost too much to try to stop climate change. Even if we wanted to, we cannot afford to replace all our power plants, our cars, and the heating systems in all our buildings – and pay more money for energy on top of it. It would bankrupt the whole country. 4. There’s nothing America can do about climate change, anyway. Even if we stop burning fossil fuels tomorrow, the climate will keep getting warmer for decades. Even if America stops global warming pollution tomorrow, China, India, and Africa will just keep burning more and more coal, gas and oil, and our efforts won’t make a difference. 5. Adaptation is the right strategy for climate change. We don’t have to deal with the whatever the problem might be. As with cancer and crime, it is safer and better for the economy if we all focus on the treatments. We should do more research and have more conferences on how to adapt to climate change. And now, the biggest lie. Even if I thought global climate change was a problem, I certainly can’t do anything about it. I’m just one of billions of people. I have no significant power or influence. Even if I stop wasting energy and use only clean energy sources, it won’t make any difference. Actually, climate change is happening all around us now, and Americans are noticing. They might not be too sure of the causes or solutions, but when their town floods, dries up, gets blown away or burns down, they know there’s a problem. Hopes that the problems will just go away or nature will return to the old normal are fading as America gets pummeled year after year with ever-increasing temperatures, droughts, and severe weather. Saying that people don’t matter and that Americans can’t do anything about climate change are self-serving claims of oil and coal companies, or misguided ones from environmentalists who think that only big government can make a difference. The exact opposite is true. You have a voice. Your actions matter. Your vote matters. A lot. In fact, anything you do about climate change, especially talking about it, makes a difference. Simply using energy more thoughtfully can save some of the money you’re literally burning, so you can spend it on health, education or fun, all the while reducing air pollution. There are many variants to the “you can’t do anything about climate change” lie. All of them are refuted by real-world examples of people making a difference. Among the lies is that you must to buy energy from your local power company. If that company burns coal, there are no options. Why then do utilities promote laws that prevent you from putting solar panels on your roof, make it difficult for clean energy suppliers to connect with you, and obstruct ‘net metering’ where you can sell energy you produce back to the grid? In much of America, these alternatives are available. In others, it’s only the laws that are stopping you from making a difference. Utilities will put ‘smart meters’ on your home to manage your electricity use, but when you want to manage your own, they will stop you. Individual and collective action can be very powerful. You don’t have to go out on the streets and protest. You just have to live by your values – and share. Many thousands of people will notice solar panels on your roof or your new electric car, and think about it. As they see you commuting on a bike, some will think of the many thousands of dollars they spend a year on car payments, gas and insurance. And when they ask about it, share your success stories. Show the savings to your dinner guests, and put it up in the blog on your local newspaper. When you have your chance to exercise your rights as an American citizen, don’t hold back. Vote for people who will give you clean energy choices. Go to the city council meetings where they are considering laws to limit your options, and say you want choices. If you lead by example, people will notice and you’ll make a difference. We all seek real-world examples for guidance to a safer, healthier, more prosperous future. Any of us can demonstrate leadership. We don’t need everybody – but America needs YOU to lead, now.